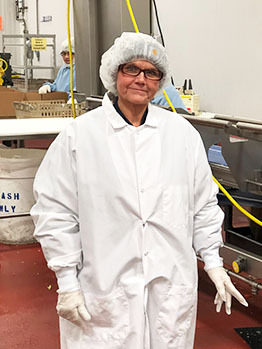 This week’s #TeamMemberTuesday is putting the spotlight on Lori, Production Team Lead at Fresh Foods Manufacturing, Giant Eagle’s Warehouse and Production facility in Freedom, PA! Lori has been with us for two years. She quickly proved herself and made the jump from Production Cook to Production Team Lead. 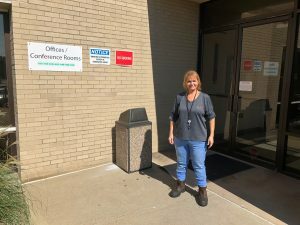 She is also a First Responder within the facility and is always quick to lend a hand. Get to know more about Lori here. 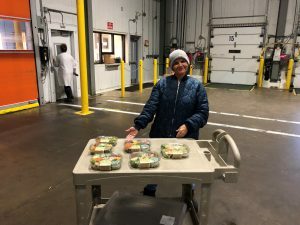 I started in November 2016 and worked as a Production Cook in the cold room. 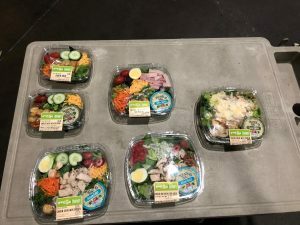 I basically stood in a conveyor line and made fresh salads. Then in September 2017, I took the position of Team Lead. Now I’m the Production Team Lead, and I usually handle most of the salad line. I supervise the line, which includes making sure they have what they need, and prep for the next salad so that the flow is continuous. We keep it very organized so that we’re ready to go and can make our time quotas. November of this year will be two years that I’ve been here. This is my first experience working for Giant Eagle. It’s a very good Company to work for. I enjoy working here and I love the 10% discount on our Own Brands products. Since I’ve started here, I’ve lost 70 pounds. I think it’s from working in the cold environment. It kick-started my metabolism to keep warm. My husband and I also go to the gym, but I think my job has had a lot to do with it. I like the job. I like the people. I like the management. I just really like working for Giant Eagle. It’s physical and it’s almost like having a little workout when I’m at work, which I really enjoy. I think when I became a Team Lead, I felt like a bigger piece of the Giant Eagle family. It’s more responsibility and it felt like I’m here to stay now. How did you go about getting that promotion to Team Lead? Two people had been promoted prior and they were doing the job, and I went to my Manager and let him know that if any other Lead positions became available, I would be interested. He was happy to hear my interest and within about two weeks, I transitioned into a Team Lead role. They were interested in me, and it was the perfect fit. I’m a First Responder here at Fresh Foods Manufacturing. We learned First Aid, CPR and how to use the AED machine and were certified. I took the class, and when people get hurt, which isn’t often, but when it does happen, I’m one of the first people to get to them and help them. I try to calm them down. I like helping others. 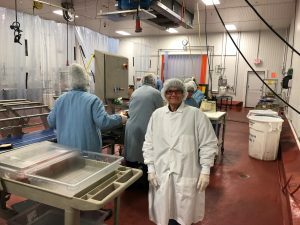 Fresh Foods Manufacturing is a great place to work. We get paid weekly, which I really like. Also, I love that our work week is made up of four, ten-hour days. The days fly by. We’re done by 2:30 pm, and then I have the rest of my afternoon to myself. 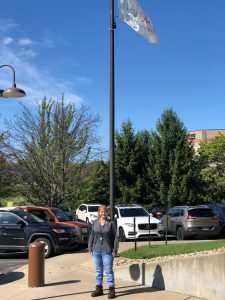 Meet Rosita, GetGo Confidential HR Coordinator & U.S. Army Veteran Meet Denise, GetGo Team Member in Ebensburg, PA!